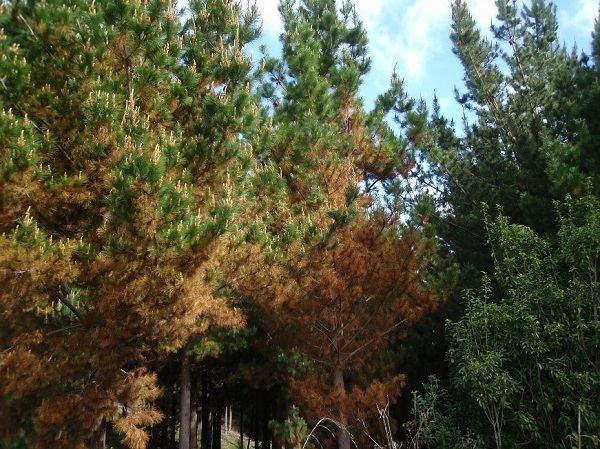 If you have noticed Pinus radiata trees recently with orange/brown needles it is likely to be red needle cast which is caused by Phytophthora pluvialis which was first reported in New Zealand in 2008. The symptoms on infected needles include distinct olive coloured bands with dark resinous spots. Eventually the needles in the lower part of the crown, and in some cases the entire crown, turn red and the needles fall off. Phytophthora pluvialis has also been reported in Oregon State USA, where it was first isolated in 2002. Phytophthora pluvialis was officially described as new species in 2013 in Oregon. With funding support from the forest grower’s levy, MBIE and Scion, a large research programme has been running since 2013 to better understand the disease, its impact and options for control. To better understand the genetic diversity and population structure of P. pluvialis, genetic markers were used to compare the New Zealand and USA populations of this pathogen. The findings showed that the USA population has twice the genetic diversity of the New Zealand population. The data indicated that this pathogen was introduced into New Zealand from the USA, which is why the genetic diversity is higher in the USA as the pathogen has been present there for a longer period of time. Interestingly, the data also showed that there were two distinct groups of P. pluvialis in New Zealand that may have come from two separate introductions from the USA. The outcomes of this study are that we now have a set of molecular markers that can monitor the current population and new incursions of P. pluvialis in New Zealand. Since the population has a relatively narrow diversity, determining the susceptibility or resistance of Pinus radiata to red needle cast can be done using a small number of P. pluvialis isolates. As the early analyses of the genomes of Oregon and NZ P. pluvialis isolates provide strong indications that the New Zealand population is genetically narrow, we should remain vigilant in avoiding the introduction of new isolates of the pathogen into our forests from overseas. 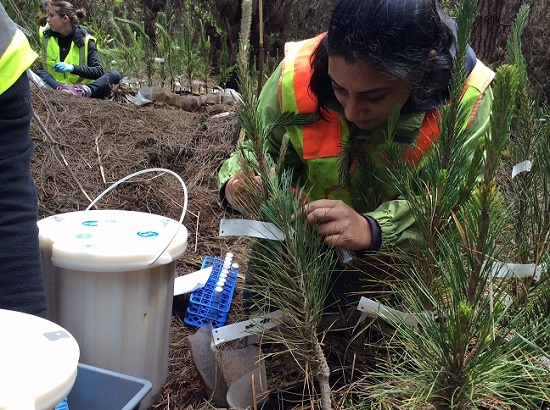 The population analysis of P. pluvialis is being carried out by Simren Brar, PhD candidate, Massey University & Scion. Analysis of P. pluvialis genomic and gene expression studies is ongoing and is led by Dr Rebecca McDougal, Molecular Forest Pathologist at Scion.